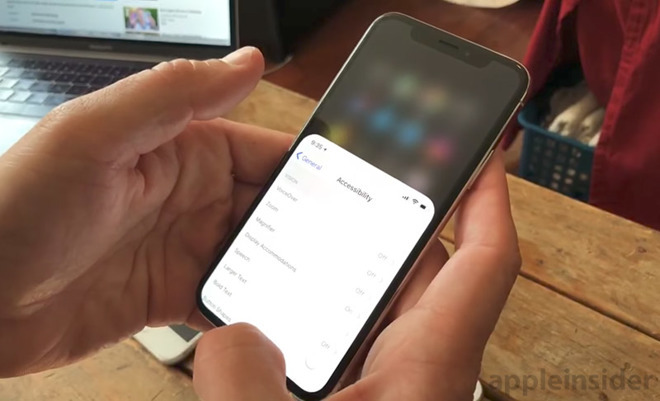 In September, rumors based on a leaked version of iOS 11 claimed Apple ditched Reachability with iPhone X, a cause of concern for some. Apple introduced the feature alongside iPhone 6 and 6 Plus to allow for the integration of larger displays without sacrificing one-handed operation. On supporting iPhones, Reachability is invoked by tapping twice on the Touch ID home button, which drops the onscreen user interface down toward the bottom of the display for easy thumb access. Double tapping the home button again, or touching an area outside of the active UI, shifts the display back up to its original position. With iPhone X and the removal of the home button, Apple has changed the basic fundamentals of Reachability, but it is still an option. Step 1: Navigate to Settings > General > Accessibility and turn Reachability on. Step 2: Swipe down from the gesture bar in any open app or the bottom of iPhone X's home page. Step 3: Perform the desired UI operation. Step 4: To reinstate the fullscreen UI, swipe up from the gesture bar or bottom of the home screen. Alternatively, touch an area outside of the active UI pane. Although the iPhone X display is taller than that of the iPhone 8, it lacks the "chin" portion of earlier designs, allowing greater latitude for thumb-based input. On the topic of ergonomics, Apple left a large area below iPhone X's soft keyboard unused, likely a consideration to foster better handling of the device. If the keyboard ran all the way to the bottom of the screen, users would grasp that portion of the phone when typing, making it top heavy and prone to drops.